CRPS 1 is diagnosed on the basis of clinical manifestations, and there are limited laboratory tests or image studies to verify the diagnosis. Several diagnostic procedures, such as bone scintigraphy, plain radiographs, quantitative sensory testing, skin temperature measurements, and fMRI are used to support the diagnosis of CRPS. 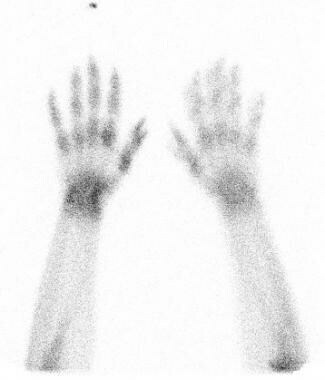 The radionuclide bone scans below depict patients with CRPS 1 (RSD). Reflex sympathetic dystrophy of the hand. Delayed image palmar view reveals increased tracer diffusely involving the entire right wrist, metacarpals, and phalanges, with juxta-articular accentuation. Relatively less increased uptake is observed distally, but all areas are involved. The dot of increased activity distal to the third ray is a hot marker indicating the right side. Reflex sympathetic dystrophy of the foot. Delayed image plantar view reveals increased tracer uptake diffusely involving the lowermost right leg, ankle, tarsals, metatarsals, and phalanges. Uptake is less distally than proximally, but all areas are involved. 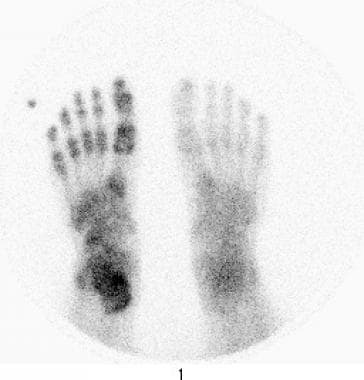 The dot of increased activity distal to fifth toe is a hot marker indicating the right side. Plain radiography is only 60% sensitive and not specific; when radiographs are positive, they often show only osteoporosis, occasionally in combination with soft tissue swelling or diffuse soft tissue atrophy. Plain radiographs of the affected limb can rule out any localized pathology to the bones, joints, and surrounding tissue. Although osteoporosis is found in as many as 60% of patients with upper extremity reflex sympathetic dystrophy (RSD), it is not specific, often representing changes of disuse secondary to the pain associated with CRPS 1. Occasionally, soft tissue swelling or diffuse soft tissue atrophy may be seen; these are nonspecific findings. No consistent findings have been found in the occasional study done with other imaging modalities, and none are suggested for diagnosis. Magnetic resonance imaging (MRI) changes in established CRPS 1 rarely have been evaluated, and as with studies using other modalities, the definition of CRPS has varied considerably. In one study by Schweitzer et al  involving the lower extremity (N=35), soft tissue thickening with and without contrast enhancement (N=31) was demonstrated without any marrow changes, while in another study of the upper extremity (N=17) by Koch et al,  no marrow changes and only inconsistent soft tissue or muscle signal changes were seen. For CRPS 1 of the hand or foot, the hallmark on the radionuclide angiogram (RNA; phase I) is diffuse increased perfusion to the entire extremity, including the distal forearm or leg and, occasionally, reaching the shoulder or hip, even when the inciting lesion is distal. Similar diffuse increased vascularity, manifested by diffuse increased tracer accumulation on blood pool or tissue-phase images (phase II) is seen. On these images, juxta-articular accentuation may be seen. RNA findings are abnormal in approximately 40% of patients and blood pool findings in approximately 50%, most often in clinical stage I or II of the disease. Pediatricians report a moderate frequency of lower extremity neurovascular or neuroregulatory disease in children that has been termed reflex sympathetic dystrophy. In these children, a bone scan pattern often reveals marked decreased tracer uptake on delayed images compared to increased uptake in adults; therefore, this may represent a different condition, such as pseudodystrophy. When radionuclide bone imaging (RNBI), especially in the upper extremity, demonstrates classic diffuse findings, RSD is certain. When RNBI does not demonstrate that pattern, the most common variant of sympathetically maintained pain syndrome (SMPS) or CRPS 1 is excluded. In the lower extremity, patients with severe infection, especially if underlying diabetes mellitus is present, may demonstrate diffuse increased delayed image tracer uptake on RNBI performed to diagnose osteomyelitis. This is not usually a diagnostic issue clinically. According to Andresen et al, outpatient CT-assisted temporary thoracic sympathetic nerve blockade is an effective adjunct therapy, with a low complication rate, for complex regional pain syndrome (CRPS). Oaklander AL, Horowitz SH. The complex regional pain syndrome. Handb Clin Neurol. 2015. 131:481-503. [Medline]. Dietz FR, Compton SP. Outcomes of a Simple Treatment for Complex Regional Pain Syndrome Type I in Children. Iowa Orthop J. 2015. 35:175-80. [Medline]. [Full Text]. Bussa M, Guttilla D, Lucia M, Mascaro A, Rinaldi S. Complex regional pain syndrome type I: a comprehensive review. Acta Anaesthesiol Scand. 2015 Jul. 59 (6):685-97. [Medline]. Borchers AT, Gershwin ME. Complex regional pain syndrome: a comprehensive and critical review. Autoimmun Rev. 2014 Mar. 13 (3):242-65. [Medline]. Weissmann R, Uziel Y. Pediatric complex regional pain syndrome: a review. Pediatr Rheumatol Online J. 2016 Apr 29. 14 (1):29. [Medline]. [Full Text]. Borucki AN, Greco CD. An update on complex regional pain syndromes in children and adolescents. Curr Opin Pediatr. 2015 Aug. 27 (4):448-52. [Medline]. Broggi G. Pain and psycho-affective disorders. Neurosurgery. 2008 Jun. 62(6 Suppl 3):901-19; discussion 919-20. [Medline]. Gann C. Reflex sympathetic dystrophy/complex regional pain syndrome. AAOHN J. 2008 Feb. 56(2):88. [Medline]. Schinkel C, Scherens A, Koller M, Roellecke G, Muhr G, Maier C. Systemic inflammatory mediators in post-traumatic complex regional pain syndrome (CRPS I) - longitudinal investigations and differences to control groups. Eur J Med Res. 2009 Mar 17. 14(3):130-5. [Medline]. Maihofner C, Seifert F, Markovic K. Complex regional pain syndromes: new pathophysiological concepts and therapies. Eur J Neurol. 2010 May. 17(5):649-60. [Medline]. Bruehl S. An update on the pathophysiology of complex regional pain syndrome. Anesthesiology. 2010 Sep. 113(3):713-25. [Medline]. König S, Schlereth T, Birklein F. Molecular signature of complex regional pain syndrome (CRPS) and its analysis. Expert Rev Proteomics. 2017 Oct. 14 (10):857-867. [Medline]. Parkitny L, McAuley JH, Di Pietro F, Stanton TR, O'Connell NE, Marinus J, et al. Inflammation in complex regional pain syndrome: a systematic review and meta-analysis. Neurology. 2013 Jan 1. 80 (1):106-17. [Medline]. [Full Text]. Mackinnon SE, Holder LE. The use of three-phase radionuclide bone scanning in the diagnosis of reflex sympathetic dystrophy. J Hand Surg Am. 1984 Jul. 9(4):556-63. [Medline]. Leitha T, Staudenherz A, Korpan M, Fialka V. Pattern recognition in five-phase bone scintigraphy: diagnostic patterns of reflex sympathetic dystrophy in adults. Eur J Nucl Med. 1996 Mar. 23(3):256-62. [Medline]. Intenzo CM, Kim SM, Capuzzi DM. The role of nuclear medicine in the evaluation of complex regional pain syndrome type I. Clin Nucl Med. 2005 Jun. 30(6):400-7. [Medline]. Schürmann M, Zaspel J, Lohr P, Wizgall I, Tutic M, Manthey N. Imaging in early posttraumatic complex regional pain syndrome: a comparison of diagnostic methods. Clin J Pain. 2007 Jun. 23(5):449-57. [Medline]. Cappello ZJ, Kasdan ML, Louis DS. Meta-analysis of imaging techniques for the diagnosis of complex regional pain syndrome type I. J Hand Surg Am. 2012 Feb. 37(2):288-96. [Medline]. Bailey J, Nelson S, Lewis J, McCabe CS. Imaging and Clinical Evidence of Sensorimotor Problems in CRPS: Utilizing Novel Treatment Approaches. J Neuroimmune Pharmacol. 2012 Oct 11. [Medline]. Ringer R, Wertli M, Bachmann LM, Buck FM, Brunner F. Concordance of qualitative bone scintigraphy results with presence of clinical complex regional pain syndrome 1: meta-analysis of test accuracy studies. Eur J Pain. 2012 Nov. 16 (10):1347-56. [Medline]. Schweitzer ME, Mandel S, Schwartzman RJ, Knobler RL, Tahmoush AJ. Reflex sympathetic dystrophy revisited: MR imaging findings before and after infusion of contrast material. Radiology. 1995 Apr. 195(1):211-4. [Medline]. Koch E, Hofer HO, Sialer G, Marincek B, von Schulthess GK. Failure of MR imaging to detect reflex sympathetic dystrophy of the extremities. AJR Am J Roentgenol. 1991 Jan. 156(1):113-5. [Medline]. Vas L, Pai R. Musculoskeletal Ultrasonography to Distinguish Muscle Changes in Complex Regional Pain Syndrome Type 1 from Those of Neuropathic Pain: An Observational Study. Pain Pract. 2016 Jan. 16 (1):E1-E13. [Medline]. Holder LE, Cole LA, Myerson MS. Reflex sympathetic dystrophy in the foot: clinical and scintigraphic criteria. Radiology. 1992 Aug. 184(2):531-5. [Medline]. Holder LE, Mackinnon SE. Reflex sympathetic dystrophy in the hands: clinical and scintigraphic criteria. Radiology. 1984 Aug. 152(2):517-22. [Medline]. Kline SC, Holder LE. Segmental reflex sympathetic dystrophy: clinical and scintigraphic criteria. J Hand Surg Am. 1993 Sep. 18(5):853-9. [Medline]. Schiepers C. Clinical value of dynamic bone and vascular scintigraphy in diagnosing reflex sympathetic dystrophy of the upper extremity. Hand Clin. 1997 Aug. 13(3):423-9. [Medline]. Andresen R, Radmer S, Nickel J, Fischer G, Brinckmann W. [Ambulatory CT-assisted thoracic sympathetic block as an additional approach to treatment of complex regional pain syndromes after sport injuries]. Sportverletz Sportschaden. 2009 Mar. 23(1):35-40. [Medline]. Kastler A, Aubry S, Sailley N, Michalakis D, Siliman G, Gory G. CT-guided stellate ganglion blockade vs. radiofrequency neurolysis in the management of refractory type I complex regional pain syndrome of the upper limb. Eur Radiol. 2012 Nov 9. [Medline]. Stanton-Hicks M, Janig W, Hassenbusch S, Haddox JD, Boas R, Wilson P. Reflex sympathetic dystrophy: changing concepts and taxonomy. Pain. 1995 Oct. 63(1):127-33. [Medline]. Zhou Y, Yi X, Xing W, Hu S, Maslov KI, Wang LV. Microcirculatory changes identified by photoacoustic microscopy in patients with complex regional pain syndrome type I after stellate ganglion blocks. J Biomed Opt. 2014 Aug. 19 (8):086017. [Medline]. [Full Text]. Sintzoff S, Sintzoff S Jr, Stallenberg B, Matos C. Imaging in reflex sympathetic dystrophy. Hand Clin. 1997 Aug. 13(3):431-42. [Medline].